Asian pears tend to be weak growing and need to be propagated via grafting of scions, or cuttings, onto hardier pear rootstock. Rootstocks that are compatible with Asian Pears include Pyrus betulaefolia, P. calleryana, P. serotina, P. ussuriensis and P. communis. 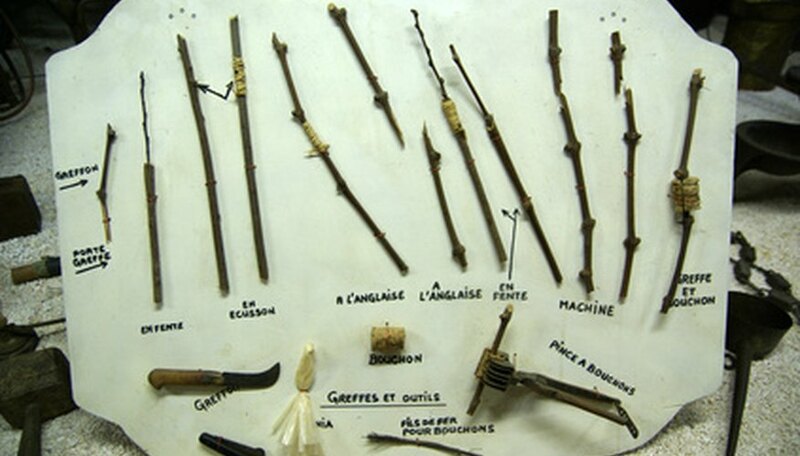 Although there are many ways to graft, a whip graft will work with Asian pears. A whip graft is best for connecting a scion and rootstock that is less than half an inch in diameter. Cut a one-foot scion from the donor tree. Cut this scion about one foot long and trim the top just above the topmost bud on the scion. Cut the bottom off just above a bud. Make a diagonal cut 1 1/2 inch long at the bottom of the scion. Make a straight cut down into the scion starting about halfway down the diagonal cut. Make an identical cut on the root stock. These two cuts will form two tongues that will mate and allow the cambium, or live growing wood of the root stock, and the scion to match up and grow together. Slip the tongue of the scion into the tongue of the rootstock. Tape the union securely with grafting tape. Cover the grafting tape and graft with grafting compound to seal and secure the graft. Grafting tape and compound will help keep disease from becoming established in the fresh graft. Remove the tape and grafting compound when you see new growth on the scion. Scions should be cut from one- or two-year-old wood. Cut the scions before the tree has started to grow, either in the winter or in very early spring, and keep them moist in cold storage until you are ready to use them. However, you can use a scion immediately after cutting, so you may not need to store your scions.